Why Use a Densifying Sealer Instead of Just a Penetrating Sealer? 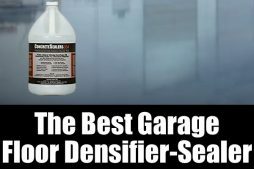 How Does a Densifying Sealer Work? Why Not Use a Surface Sealer? 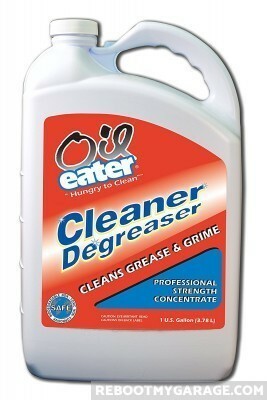 Oil Eater is hands-down one of the best de-greasers I’ve ever used. It removes caked-on grease and old oil stains from concrete, asphalt, and fabric. Some stains take a few applications, but no stain is safe with Oil Eater around. 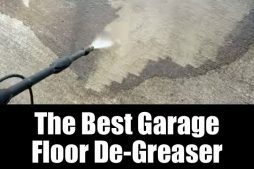 Cleaning and de-greasing is required before any type of garage floor repair. This is to ensure that whatever you use has a bondable surface for whatever paint and repair products you wind up using. Feeling like you’re ready to go at that concrete low spot with an angle grinder or clean out that cracked floor with a crack-chasing blade? 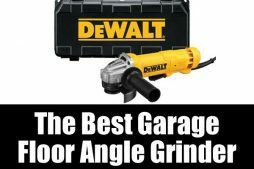 If you don’t have an angle grinder already this is the one we would get. The DeWalt DWE402K, tops our list because it’s designed to grind in close spaces, has multiple safety features, and an excellent reputation for ease of use and durability. 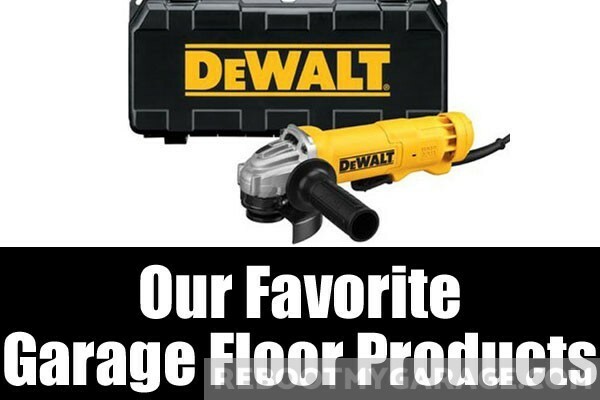 DeWalt has been around for many years and is a brand we have trusted. You can find the current price and reviews over here on Amazon. NOTE: This is a spark-throwing tool, so be sure you (a) wear safety equipment and (b) understand the angle grinder proper usage. You’ll need the crack-chasing blade for your angle grinder. The best 4.5 inch blade is the Benchmark Abrasives 4.5 in. Crack Chaser Diamond Blade. This is the blade that cuts concrete like butter. If you own a 4 in. angle grinder already, then get the EDiamondTools 4 in. Crack Chaser Blade. Customers report that it barely shows signs of use after cutting hundreds of feet of concrete. Check the latest prices on this angle grinder on Amazon. Prep work is the key to good concrete crack repair. For smaller garage floor cracks, clean with a wire brush and vacuum with the upholstery attachment. One of the nicest crack cleaning brushes I’ve found is the Forney Wire Scratch Brush. It’s shaped into a “V” or arrow at the top making it easier to push into small spaces. 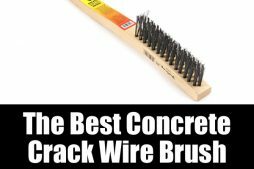 This brush has carbon steel bristles that will make short work of concrete repair preparation. Check it out on Amazon. Etching the garage floor ensures it will most readily accept paints, stains, and sealants. This used to be done with acid, but that has hazardous downsides. Rust-Oleum Clean & Etch does everything muriatic acid does, without the fumes or burning. This is the acid-substitute etching product that has no odors, no acid, and no dangerous chemicals. It does not need to be diluted after application the way acid does. It’s harmless to plants, pets, and kids. This bottle will treat up to 500 square feet of concrete garage flooring. 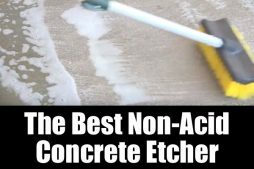 While you don’t need to neutralize acid after application, you should rinse the floor three times to ensure no product is still etching your concrete. Wearing rubber gloves and goggles, dilute the solution into a watering can. Use the watering can to apply Clean & Etch to your garage floor. It will start working right away. You’ll hear it fizz. Use a big fluffy long-handled brush to work the product into the floor. Rinse three times, then squeegee off excess liquid. Get a bottle of Clean & Etch here. You can watch the short how-to video below for more information on how to use Rust-oleum Etch & Clean. If left untreated your garage floor is vulnerable to road salts and staining from oils and fluids. Some concerns are primarily cosmetic but constant exposure to road salts and excess water can lead to damage like spalling. Also, untreated floors generate dust which starts to cover your car and other belongings and which you wind up tracking into your house. I recommend PS104 by Concrete Sealer USA because it merges the qualities of both a densifier and sealer in one easy to apply product. It also doesn’t change the look of your garage floor and leaves the floor as paintable as it was before you started. Penetrating sealers do not strengthen your floor and the manufacturers generally recommend that you use a densifier first to prevent the sealer from going in too deeply, forcing you to use more product to be effective. PS104 works by penetrating the concrete. It is a water-based product which allows it to be absorbed by the concrete where the lithium in the product bonds with the calcium hydroxide to create something called CSH (calcium silicate hydrate) which is what makes concrete strong. 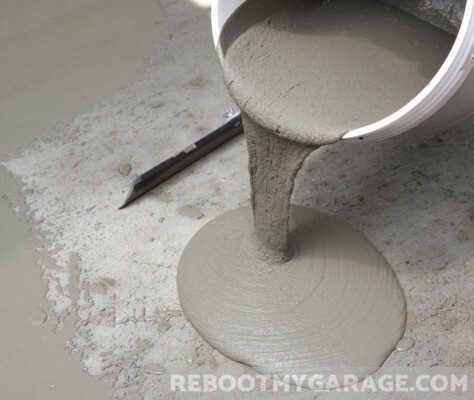 The CSH fills in the pores of your concrete floor making it denser and harder. It also does a good job at repelling road salts and deicers and protects against the damage of freeze thaw cycles. That is how the densifier portion of PS104 works. PS104 also contains siliconate which acts as a sealer just below the surface. It is important to note that this is not a surface sealer which would bond on top of the floor. It will do a very good job of repelling stains but it does not create an impervious barrier. If you keep after stains and don’t let them sit for a long time you will be fine, however. It also repels water and protects against moisture, and prevents mold and mildew. If you absolutely, positively need to have a garage floor that will be impervious to stains from oils and other chemicals then a good quality surface sealer is what you need. but before you say yes to that consider that applying a surface sealer requires a lot more prep work and is much more labor intensive to apply. And keep in mind that a surface sealer will prevent you from painting or staining your garage floor in the future as that sealer will need to be removed. A densifying sealer such as PS104 gives you the best of both worlds at a reasonable cost and modest amount of effort. 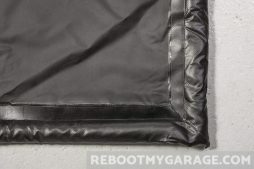 The AutoFloorGuard Compact, Midsize and SUV/Truck mats are the best garage floor snow containment mats. This is the containment mat with taller-than-usual closed cell foam sides to handle New England and Midwest snowmelt. The taller-than-normal sides allow this mat to hold gallons of water. The fabric and seams are reinforced. The “stay put corners” mean you don’t need double-sided tape to hold it down. AutoFloorGuard is also sending out a free squeegee with this model mat. You will find this mat to be flatter than most others, which often have an annoying amount of wrinkling in them. This mat resists mold, mildew, rot and UV rays. Check out the latest prices for the snow containment mat on Amazon: Compact Mat, Midsize Mat, and SUV/Truck Mat. Special Note! 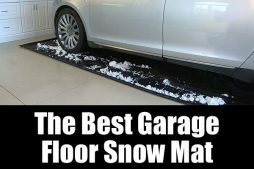 No garage floor containment mat can stand up to studded snow tires. 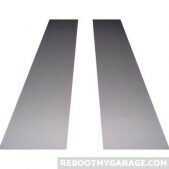 If you have these on your car, you’re also going to need Auto Care Products’ Vinyl Protector Strips. Lay these out where your tires will drive on the containment mat. You can fix spalling, pitting, cracks and low spots with polymerized concrete patchers. 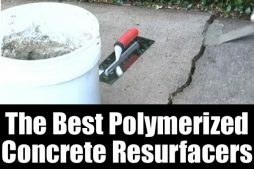 Polymerized concrete is an epoxy concrete patching alternative that binds a concrete patch onto the damaged concrete area. Concrete will not stick to concrete, so the polymer performs the bond. Instead of mixing parts together, you just add water. But you do need to act quickly once you’ve added water to your polymerized concrete. It will harden in your bucket. Sakrete Top ’n Bond Concrete Patcher is the best polymerized concrete low spot leveler, and crack, spalling and repair patch for small areas. You will apply it with a trowel. For larger areas, a squeegee polymer is easier. Use Flo-Coat for that, details are below. 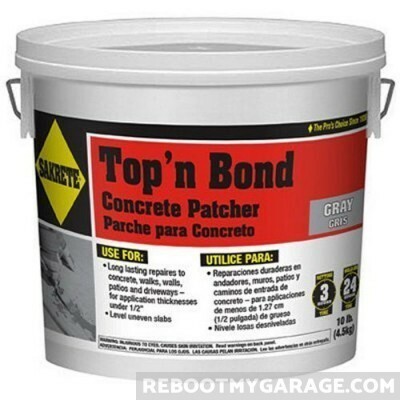 Top ‘n Bond Concrete Patcher is a sand and concrete mixture that adheres to uneven surface areas. Mix with clean water and apply with a trowel. Top ‘n Bond repairs spalling up to 1.5 in. deep. Unlike epoxy, which requires that you mix at least two materials together, Top ‘n Bond requires only water. Err on the side of mixing in too little water until you’re happy with the consistency. Carefully follow directions. As it is with epoxy, you have a very short bucket life before your patching material hardens. You have 20 minutes from mixing to feathering, so only mix what you can use. Sakrete Top ‘N Bond is easy to apply and dries to a rock hard and level finish. One 10 lb. pail covers 4 sf. at 1/4 inch depth. You can walk on it after one day, and drive on it after three days. Sakrete Flo-Coat Concrete Surfacer is the best polymerized concrete patch for large areas of spalling, pitting, cracking and uneven areas. This flowing slush is especially appropriate for larger damage because you apply it with a push-broom squeegee rather than a hand-held trowel. If you have any cracks that are 1/8 inch wide, mix a small portion with less water. Trowel this tougher mixture into the crack before using the looser mixture. When mixed with the correct (looser) ratio of water, Flo-Coat flows into the damaged area, covering it with a medium gray concrete bond. Flo-Coat fixes cracks and damage up to 1/2 in. deep. At about 1/4 inch of layering, 20 lb. of Flo-Coat covers 9 sf. At about 1/16th inch per layer, 20 lb. will yield 36 sf. of coating. You can add red or buff color pigment to your mixture. Apply when the temperature is between 50 and 90 deg. F.
Use when the temperature is between 50 and 90 deg. F.
Ready to fix that garage floor crack or low spot? You can mix the epoxy mortar by hand, but it’s a lot easier to use a power drill and mortar mixer. A mortar mixer is like an egg beater that uses the drill’s power to mix your patching material. The ABN Power Drill Mixer is the best drill-powered mortar mixer I can find. It’s the most highly-rated and also the least expensive drill mixer. Use the ABN Power Drill Mixer to prepare mortar, epoxy, grout or joint compound. While you can use a paint stick to mix your driveway repair patch, the electric drill will create a much more unified mixture with no chunky spots to ruin your repair. You do need a 1/2 in. drill for this mixer. If you have a 3/8 in. drill, get a 3/8-to-1/2 inch drill adapter here. Get the ABN Drill Mixer here. 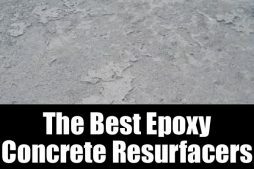 Epoxy Patch is the best three-part concrete crack repair system. This is the patching epoxy that dries 10 times stronger than regular cement. It can be applied to cracks up to 1 inch thick. It creates a 100% waterproof crack repair. You can also use it to fix holes and pitting in concrete, as well as asphalt, wood and metal. This is a resin-hardener-aggregate kit that dries in about one hour and cures in two to a medium gray color. You have an hour to work with the mixture, which is much longer than other epoxies give you. Please remember that you have to work within the product guidelines. I have to shake my head at someone blaming the epoxy when they used the product incorrectly. Fill deeper cracks with sand. Don’t just pour Epoxy Patch into a vast canyon of a crack. But if you’re at all concerned that the crack is structural, get a professional to assess the damage. 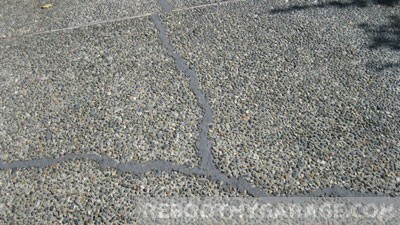 Don’t expect a crack filler to fix a flood under the concrete structure. This product fills cracks with a hard, expanding, waterproof patch. Learn how to diagnose a structural crack here. For up to 1 inch wide x 2 in. 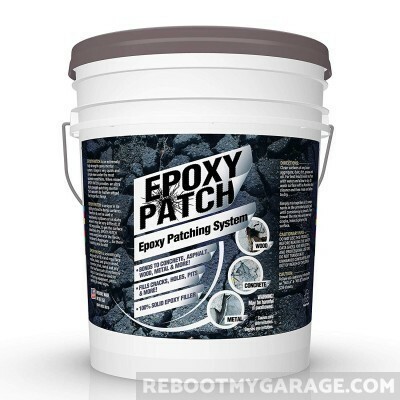 deep cracks, fix it with the easy to use Epoxy Repair that you can buy here. Epoxy Patch fixed this crack. No epoxy system will fix the structural and probably water-based problem seen in this basement. 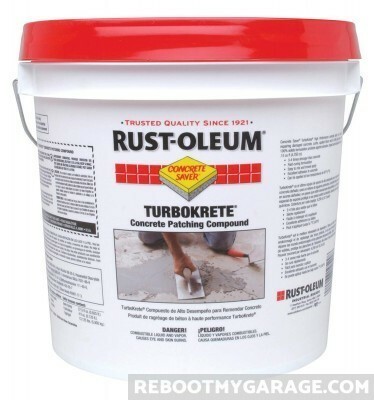 Rust-Oleum TurboKrete Concrete Patching Compound is the best 3-part epoxy patching compound for larger areas of concrete spalling, pitting, cracks and holes. This is the epoxy that fixes severely damaged spalled and pitting concrete floors. It works to patch even deeper holes and cracks. It patches and seals the affected area. TurboKrete compound dries to 3x stronger than concrete. Walk on it in 4 hours. TurboKrete requires careful planning. From the time you mix the aggregate, base and activator you will have 20 minutes to set it in place. It’s really important to be ready to use the TurboKrete as soon as it’s mixed. Mix up the amount you’re about to put down in a 10 minute period. It dries in the bucket after 20 minutes. Sand is included with the product. The more sand you use, the tougher it will be to trowel. The product will work fine if you hold back up to a third of the sand. Unlike other epoxies on this page, TurboKrete is not readily mixable by hand. 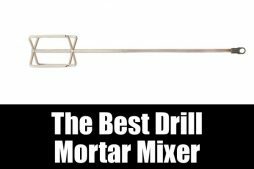 Use a drill-powered mortar mixer. Apply TurboKrete only between 45 and 90 deg. F. It will dry to a light grey. Rust-Oleum Patch & Repair is the best 2-part epoxy patch repair for concrete cracks up to 1 inch, and small areas of spalling/pitting. This tried-and-tested concrete patch dries in 8 hours. It will permanently bond to the existing concrete. It will dry to a medium gray which you can paint after a day of curing, but wait until warm weather for best painting results. 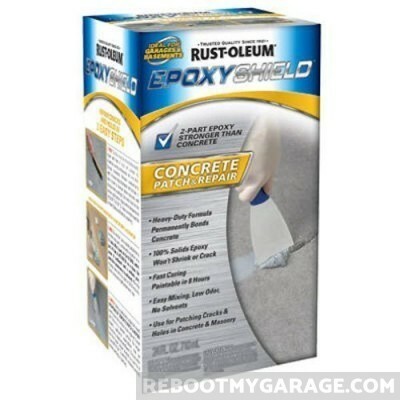 Get Rust-Oleum Concrete Patch & Repair here. 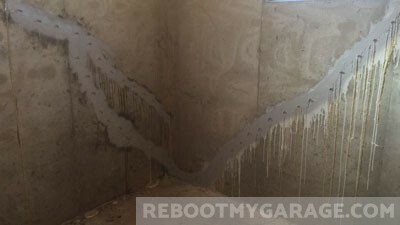 RTG Concrete Crack Filler is an epoxy, but you don’t have to mix it on cardboard or rush to apply it before it gets hard. That’s because RTG mixes the resin and hardener for you, right inside the dispensing tube. As you push the bottom of the applicator, two cartridges release their epoxy components into the tube. You get a mixed epoxy crack filler right out of the mixing tip. RTG gives you a waterproof crack repair up to 1/2 in. wide. Install the applicator into a caulking gun, aim and fire. It’s best if you wait for warmer weather to apply RTG. Wait until it’s at least 55 deg. F. Paint after one day. Use a UV protective paint if the crack repair is in direct sunlight. Great Products. Worked as Expected. 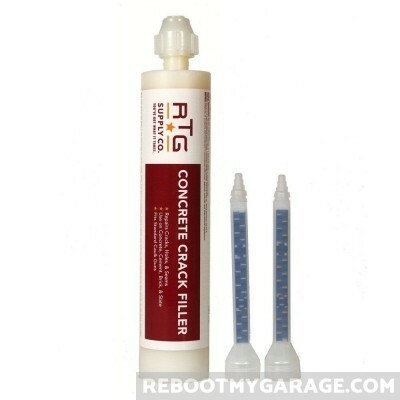 Get RTG Crack Filler here.